Tom got something here with these ring things. 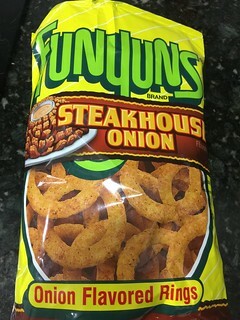 Okay imagine the texture of FUNYUNS…..
….but they nacho flavored instead of onion…. 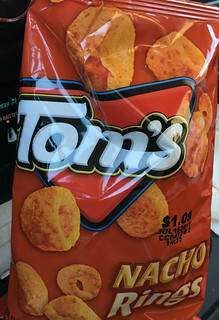 …yeah baby….you got Tom’s Nacho Rings. 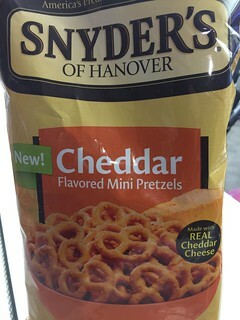 These things are HIGHLY addictive, YO! Found them at my local QT. I love Cheez Its. I love bacon. I am not bowled over by these. 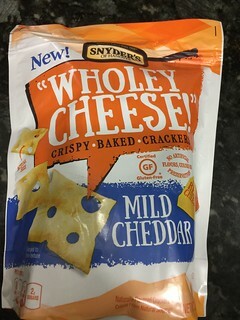 The cheddar is there but that bacon….flavor…..just seems….FAKE’n, than bacon. I think they used just a touch too much of the bacon flavor. If it was more mild, it might not stand out so much. Okay, I wasn’t too impressed with the other Pringles LOUD offering…so when I saw this other flavor I was leery. 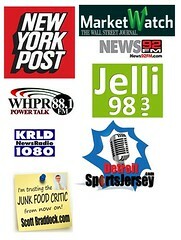 But the concept called to me….loud crunch….salsa flavors….sounds too yummy. I can annoy people with a crunch and enjoy salsa flavors at the same time? These do have a loud crunch and some good flavors too. Like salsa on a chip…..made me all fiesta-y inside eating them. Okay. Please pay attention right now. Hear what I am saying…writing…whatever. The. Absolute. Best. Ritz. Ever. Made. 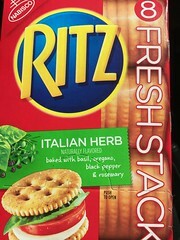 Ritz, by themselves, are great crackers, but sometimes you want something kinda classy. Kinda expensive or imported. Something you can show off at a party. Well…these…are them. That Basil, Oregano, Rosemary, and Black Pepper blend really NAILS it. These taste so fancy!